A smear of clouds in the summer sky. 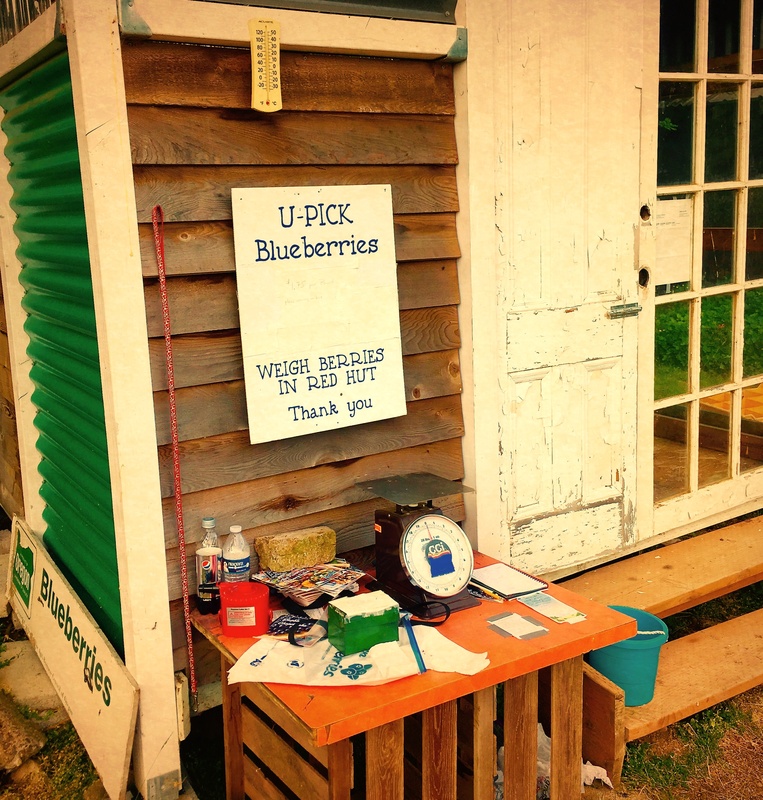 Recently, my wife and I visited a U-pick blueberry farm in the upper Hood River Valley. Our son and granddaughter joined us to help with the harvest. Upon arrival, mourning doves crooned in the surrounding forest. A smear of clouds waltzed across the summer sky. An acre of mature bushes, loaded with ripe fruit, beckoned. The farm is located on Dee Flats, near our old stomping grounds adjacent to the Mt. Hood National Forest. This plateau of volcanic rock is noted for the depth of its topsoil. 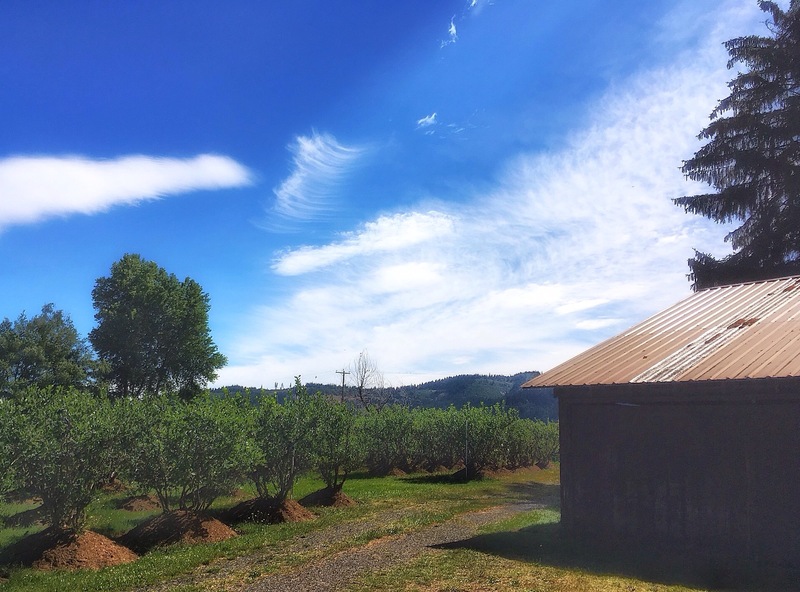 Fruit orchards prosper in the fertile sediment deposited over time by winds that scour the Lost Lake Canyon. U pick and the honor system. Weigh the berries and put your money in the box. We live in town now, 15 miles downriver, but for over 35 years had a small house within a mile of the berry patch. In years past, I ran the roads of this plateau to alleviate the stress of work and parenting. Later, when recovering from a stem cell transplant for my cancer, multiple myeloma, I recuperated with daily walks around the cultivated blocks of pear orchards. Often, my youngest son and his goofy dogs accompanied me on the circuit of farms. This visit to the former neighborhood evoked memories of family history. It was here that we sank roots deep into a mountain community and made a small Oregon town our home. One son, Noah, has moved away, yet it was he who pined most for the homestead of his youth when we sold the house. Me, my wife Marilyn, Savannah, and her Daddy, Isaac. The other son, Isaac, the aforementioned youngest, chose to remain in the valley. 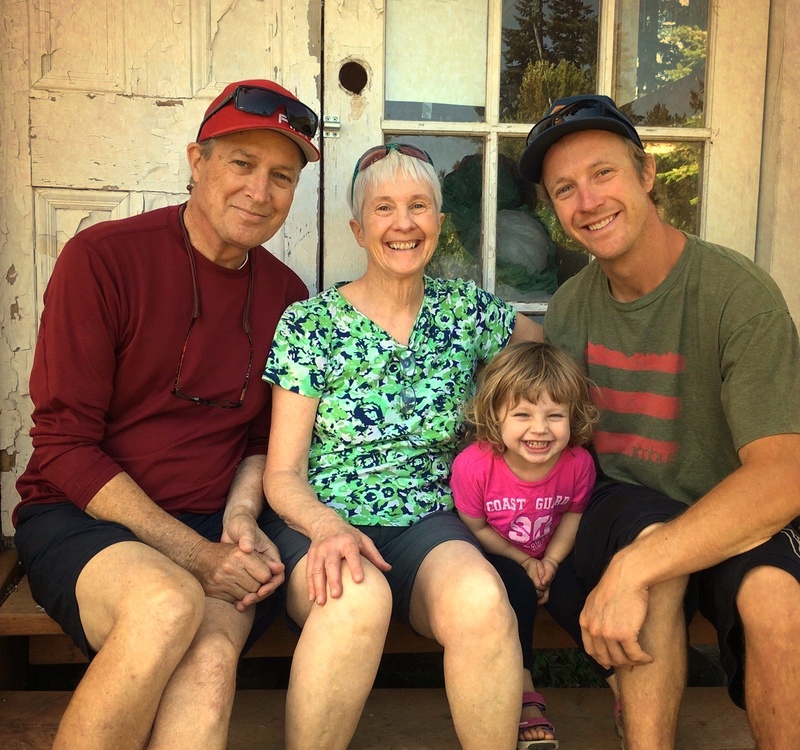 His family resides close to Dee, along the east fork of the Hood River. He and his little girl, Savannah, joined us shortly after our arrival. The plump berries rolled off their stems and through our fingers like marbles. Within moments, blue streaks from the irresitible fruit colored Savvy’s cheeks. Our buckets filled quickly. Soon, 43 pounds tipped the scales at the pay station. So too, my heart felt the sweet weight of reminiscence on what we’ve known together: the joys, the hopes, love and pain, the investment into and profit from nurturing children, the confidence instilled, the fear and missteps, the forgiveness, and, most of all, the shared trust for the journey, not the destination. Savannah. Not many berries made it to her bucket! Savannah gobbled the berries. Like a famished bear cub, she could not stop. The day seemed perfect and life simple. I imagine, though, uncertainties await her, as they do for any child. Given my age, I can never know what solutions she will choose. Yet, I am consoled. She has excellent guides. We split our bounty to freeze for the winter months. Doves continued their serenade. More pickers arrived. 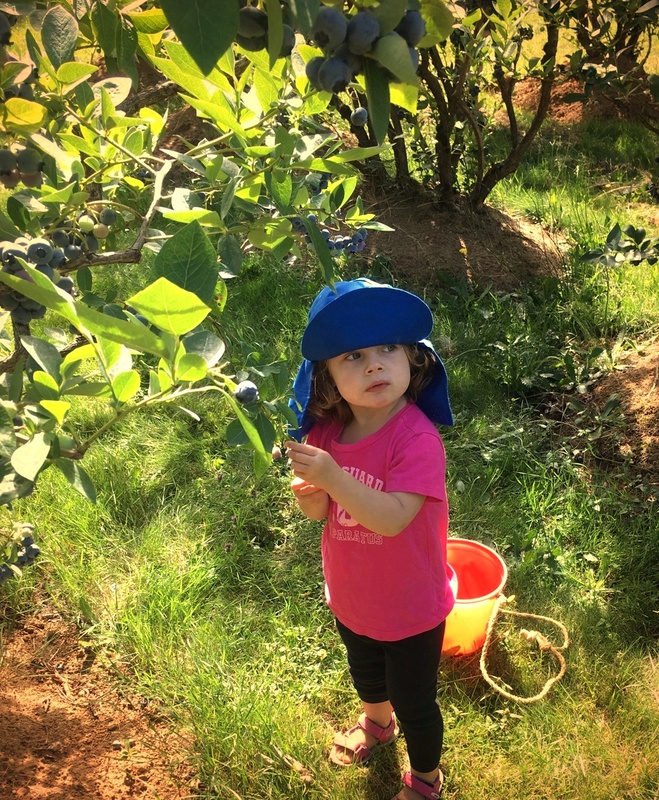 Their children darted among the bush rows to enjoy the natural candy of blueberries. We paused a moment for photos in the morning light, then departed. Love the picture of the four of you, everyone looks content and Savvy is all lit up as usual, Miss Personality. Beautiful to read. Such comfort in the wisdom. And love the photos. Yes, a perfect day and given the violence in our US of A, important to share. 43 pounds! I’m envious for your blueberry-rich future. Lovely family photo with strong resemblance between the generations. Here’s to blueberry pancakes in a warm kitchen, snow on the ground outside. Nothing quite as good as freshly picked blueberries ~ except the company you were with.